In a large bowl combine all ingredients except the cilantro. Toss gently but thoroughly, making sure all fish is coated with lemon-lime mixture. Cover and refrigerate for one to three hours, stirring occasionally. Fish should become quite white and scallops will lose translucent appearance. (Once this happens, you will know that the lemon juice has cooked the fish). For garnish add diced cilantro on top. Ok this is a great ceviche recipe. Only question, if I only put in half the avocado, where does the other half go? And are the crackers for dipping too, just like the tortilla chips? I believe this to be by far one of the best Ceviche recipes I've come across.I used fresh talapia filets,made it in the morning,let it sit for 4-5 hours.Ate it for lunch,came out delicious. 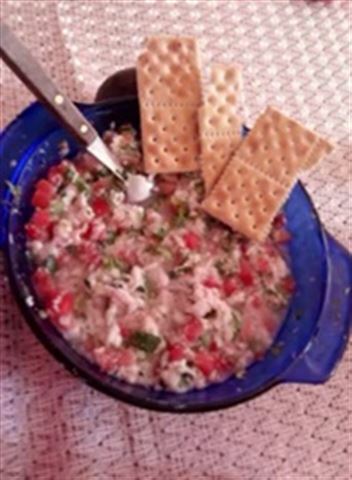 ceviche is a fantastic dish! however, this recipe is guilding the lilly, so to speak. it can do with a much simpler recipe because it doesn't need so many ingredients. all you need is fish, tomato, onion, cilantro, lemon and lime juices and salt and it's perfect! also, I reccomend shrimp and crab for the seafood, but this recipe is very good both ways. cheers.